Thirty years ago, as of this week, Dirty Dancing premiered in theaters; ever since, no one has legally been allowed to put Baby in a corner. 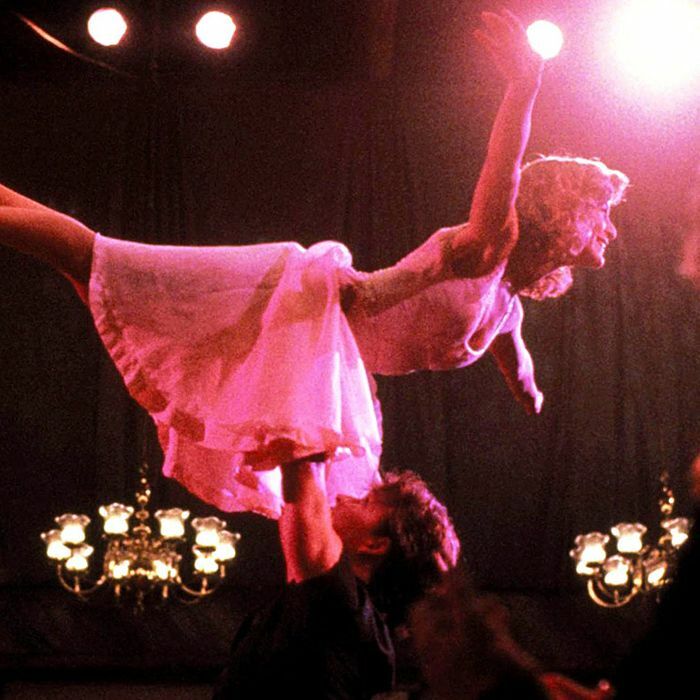 However, what they were allowed to put was Dirty Dancing’s famous lift into movies and TV. The court never stipulated this, but based on the evidence of so many scenes, it appears the justice system, at minimum, has agreed to look the other way. So go for it! The Lift is a useful reference because everyone knows it (even if they never saw the movie), so it’s an easy shorthand, a good way to say, “This scene is over.” That said, if you’re going to employ The Lift, it’s important to know that there are certain categories into which your Lift usage must fall. [To the tune of the part of “(I’ve Had) the Time of My Life” where they sing, “It’s the truth.”] It’s the truth! Below, we’ve examined the ways that the Lift has been used — or rather, reused — over the past three decades. Sometimes, there isn’t really a joke to be had at the expense of The Lift. You just do it, earnestly. People will like it, because they also remember that The Lift happened, and want to feel like they’re not alone in the world. Stars: They’re just like us, except they get paid to be like us, and we get paid to work at The Body Shop. This Lift demands famous people, but once you’ve got those, it’s pretty easy. Here, you’re essentially just doing The Lift again, like above, but this time the part of Baby is played by a man dressed like a woman and isn’t that funny. Could be considered an example of the Nostalgic But With Famous People Lift, depending on whether you think Abigail Breslin is famous. You might be asking yourself, “Why would I reboot an entire movie just to do one dance move?” until you realize that’s exactly what ABC did. See, because The Lift involves lifting, it’s very useful and nice to use it to point out how certain people (usually women) are heavy. This is funny because how dare these people aspire to feel love/support/like they are flying? A more elaborate version of this is Jon Rudnitsky’s solo lift bit that got him on SNL, which he eventually did on SNL. The Lift for people who don’t know what you’re freaking even talking about, mom. What, were these people born in a barn or Asgard or another place equally far from the Catskills, like Australia? The Huh? Lift is a subversion of the Nostalgic Lift. It is what they call, in the “business,” a “misdirection.” See, usually when someone does The Lift, the direction is up, but here the direction is the opposite (down). This is The Lift that is done on Bob’s Burgers. It’s defined by featuring Bob’s Burgers characters and, in this case, the names of Bob’s Burgers’ cast and crew. It’s perfect for when you’re working on a project that is Bob’s Burgers.